Ladies and Gentlemen, marsupials of all descriptions–WE HAVE LIFT-OFF! 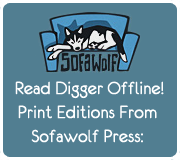 THE DIGGER OMNIBUS KICKSTARTER IN ALL ITS OMNIBUSSYNESS! We got goals. We got stretch goals. We got art. We got—are you ready? Commemorative hand-forged pickaxes. We have video. WE HAVE A KICKSTARTER. So, uh, yeah. Check it out. I think it’s cool.